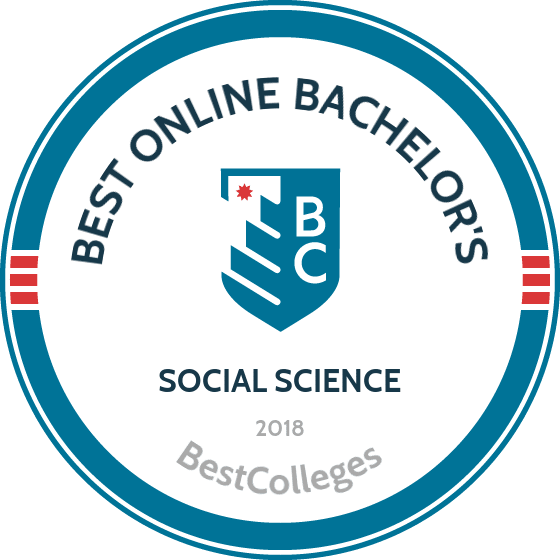 What Are The Best Online Bachelor's in Social Science Programs? What Else Can I Expect From an Online Bachelor's in Social Science Program? An online bachelor of social science degree prepares students for a range of careers in a number of fields. Social sciences include academic areas such as sociology, psychology, geography, political science, history, economics, and linguistics, among others. Although these fields cover an array of careers and subject matter, all fundamentally deal with human interactions and society. The Bureau of Labor Statistics estimates that the average annual salary for social scientists and related workers is $80,860. A social science online degree prepares you to join a rapidly developing world of human studies by using data, statistics, and history to learn about our shared future. The content of a bachelor of social science degree varies significantly from school to school. Most social science online degrees have specific majors or disciplines like economics, political science, or history. Within a specific major, the coursework, program focus, and career outcomes also vary. A general bachelor's degree in social science covers topics and material common in the disciplines, such as statistics, research methods, sociology, basic economics, history, professional communication, and philosophy. These common core classes are helpful to any student who pursues a career where professional analysis and communication are necessary, or where data and research are required. A bachelor of social science degree helps you pursue a number of careers. Choosing a political science subfield can lead to careers in state politics or placement in a top law school. Concentrating in sociology can lead to scientific research on human nature or market research for a major commercial business. A bachelor of science in social science specializing in psychology could lead to a career as a therapist or consultant. Social science degrees are designed to deliver a set of broad knowledge and an area of specialization applicable to a wide set of problems and careers. Many programs have senior projects or theses to cement these ideas in a final capstone. Colorado State University - Global Campus offers a flexible social science online degree. As a degree completion program, CSU-Global’s bachelor of applied social sciences is designed for adult learners who need to balance their studies with work and family responsibilities. The program offers monthly term start dates and accelerated eight-week courses, allowing students to earn their degrees more quickly and on their own schedules. The courses are also taught asynchronously. Students complete 120 credit hours, with 30 credits devoted to core courses in social science. CSU-Global’s generous alternative credit policy lets students transfer credits based on military experience, competency exams like AP and IB exams, and even corporate trainings and professional licenses. Students are also encouraged to pick a specialization from more than 20 options, such as marketing or organizational leadership. Located in Irvine, CA, Brandman University (BU) offers a flexible bachelor of arts in social science fully online. Students customize their degree by selecting three concentrations from among history, organizational leadership, criminal justice, political science, psychology, and sociology. Students designate a top concentration as the primary focus of their degree. Between core course and concentration area requirements, students complete 51 major credits to earn their bachelor of social science degree. Students can also transfer up to 12 credits from another regionally accredited institution, and credit may be available for military experience. BU’s social science online degree is taught according to the school’s iDEAL model (Instructional Design for Engaged Adult Learning). Students communicate with their professors and classmates in a virtual classroom, which is accessible 24/7. BU offers year round online sessions, and courses are taught asynchronously. University of Maryland University College’s bachelor of science in social science takes an interdisciplinary approach to the most pressing current social issues. Online students select a disciplinary focus from one of the following: anthropology, behavioral sciences, gerontology, psychology, or sociology. In addition to general education and elective requirements, students complete 30 credit hours in the major -- 12 of which are in the student’s disciplinary focus. UMUC’s program accepts up to 90 transfer credits to apply toward the 120 credit bachelor’s degree. The program is taught asynchronously -- with weekly or biweekly due dates for assignments -- and courses are delivered in eight-week sessions. Students may also take select courses as hybrids, which combines online coursework with in-person sessions on campus. UMUC offers reduced tuition rates for in-state residents and active-duty military members and their spouses. Students with an earned associate degree through a Maryland community college may be eligible for UMUC’s Completion Scholarship. Delivered through its Global Campus, Washington State University’s (WSU) online bachelor’s degree in social sciences is the most flexible online degree the school offers. The program offers 12 specialized concentrations, including criminal justice, comparative ethnic studies, and women’s studies. WSU’s social science bachelor’s degree follows two tracks: in Plan A students pick two concentrations, and select a primary concentration to focus on. In Plan B, students take classes in three areas of concentration, with nine credit hours in each. In addition to major requirements, online students in the social science bachelor’s degree complete WSU’s core requirements, which can often be fulfilled by transferring an associate degree. The courses in this program are delivered through Blackboard, though WSU has its own team of designers to create additional graphics, multimedia, and games for online programs. Online students also have access to virtual mentors and a student services department specifically for WSU’s Global Campus. The University of Hawaii - West Oahu developed its online distance learning program to meet the needs of students on neighboring islands. While UHWO offers an online bachelor’s degree in social science, not all general requirements to earn the degree can be completed fully online. Typically, students in this online program transfer an associate degree earned at a partnering University of Hawaii Community College, or first fulfill their general requirements at UHWO’s campus. UHWO offers three concentrations for its bachelor of arts in social science: early childhood education, psychology, and political science. The early childhood education concentration specializes in children from birth to age eight, and students in this program are assigned a faculty advisor to assist with planning academic schedules. The psychology concentration offers four areas of focus: human development, social psychology, experimental psychology, and clinical and applied psychology. The political science concentration, meanwhile, takes an interdisciplinary approach, with course topics ranging from the politics of food to global political issues. Located in Troy, AL, Troy University has been offering cutting-edge distance learning options to students around the world for 20 years. Students pursuing the bachelor’s degree in social science at Troy choose from among three concentrations: general social science, geography, or leadership. Program coursework introduces a wide range of disciplines, including anthropology, sociology, history, and economics. Courses are nine weeks and delivered asynchronously through Blackboard. To enhance the connection with fellow online students, Troy hosts the Trojan Café, an online virtual meeting place for its students around the world. Troy also reserves a handful of scholarships specifically for online students. Eligible students must be transferring from another institution and have maintained at least a 3.25 GPA, and are active-duty military or full-time employees of one of Troy’s corporate partners. Founded in 1971, Excelsior College (EC) offers career-focused degrees in flexible, affordable formats to best accommodate adult-learners. EC’s online bachelor of science in social sciences allows students to earn their degree quickly, due in part to a rotating eight-week schedule. The school’s generous transfer credit policy also lessens the credit load for students; transfer credit may be given for military education, professional training, or work experience. The 120 bachelor’s degree includes a capstone course taken near the end of the program, and credit for the capstone course cannot be transferred into the college. Students also can also select a concentration in environmental studies, international relations, or human services. To make the program more affordable, EC offers interest-free tuition payment plans. At Central Washington University in Ellensburg, WA, the bachelor of science in interdisciplinary studies-social sciences is an interdisciplinary, student-designed program. Intended for those who prefer the freedom to create their own course of study, students work with a program director to develop a program around three core disciplines. Students in CWU’s online bachelor of social science program benefit from having their own designated program director. Students also choose between completing a 62 credit major or a 47 credit major -- however, the 47 credit major must also major in another subject or select a minor. Non-resident students enrolled in the online social science program at CWU pay in-state tuition rates. Note that CWU is not authorized to provide this online program in all 50 states. California State University - Chico (CSUC) offers two ways to pursue a social science degree online: in multidisciplinary studies or specialized studies. To earn a bachelor of arts in social science in the 36-42 credit multidisciplinary studies track, students take a broad range of courses that rotate on a two-year system. Those interested in teaching social studies at the secondary level should select this option, as it prepares students to sit for the CSET exam, a requirement for teacher credentials. The specialized studies track is a 45 credit major with a primary and secondary area of study; for online students these areas are sociology and career and life planning. CSUC’s social sciences program is designed for students with an earned associate degree; those without an associate will need to fulfill general requirements online and on-campus before entering the program. The social science online degree offered at Portland State University (PSU) is designed for students who have completed the first two years of their bachelor degree. While the program covers a wide range of disciplines, their bachelor in social science degree is suited for students considering careers in teaching, social work, counseling, or related fields. Students work with an academic advisor to develop a personalized plan of study, which includes coursework in Chicano-Latino studies, anthropology, criminal justice, or urban planning, among others. Students need 180 credits to graduate from PSU, with 72 of credits fulfilled by taking upper level courses in their chosen social science discipline. PSU boasts a collaborative online learning platform for students to receive the same robust instruction and guidance they would in the classroom. Oregon residents receive discounted tuition for online programs. With campuses across rural Nevada, Great Basin College provides student-oriented, career-focused degree programs. GBC’s bachelor of arts in social science is designed for adult students who juggle working full- or part-time and family responsibilities. The flexible program specializes in four disciplines: anthropology, history, political science, and psychology. The program ends with a capstone project, and students also have the option of completing an internship. Students in GBC’s 120 credit bachelor of social science online degree complete 60 credits to fulfill general requirements, which can often be achieved by transferring an associate degree. Students then earn 60 major credits. Online students who are non-Nevada residents pay an additional charge of $72 for each upper division course. Students residing in Massachusetts cannot currently earn an online degree from GBC. At the University of Nevada - Las Vegas (UNLV), degree-seekers have the flexibility to design their bachelor of arts in social science studies. Students work closely with an advisor to select coursework that aligns with their degree and career goals. During their final semester, students participate in a capstone course to produce an in-depth paper, project, or presentation. Core classes include interdisciplinary research methods, critical thinking and reasoning, and interdisciplinary inquiry. Online classes at UNLV are administered in a flexible format, allowing students to complete coursework on their own schedules. Online courses are taught by the same faculty who lead on-campus courses, ensuring students receive the same high quality education. There is an additional tuition fee for nonresident students enrolled in the social science bachelor’s degree, though students may qualify for a fee reduction if they take online courses exclusively. Located in Saratoga Springs, NY, SUNY Empire State College (SUNY ESC) offers a bachelor of arts in social science examining the intersection of history, economics, politics, and social structures. Students work with a faculty mentor to design a program of study that combines anthropology, political science, and sociology, while also imparting research and critical thinking skills. Students at SUNY ESC select from among six concentrations, or choose an interdisciplinary focus with multiple concentrations. Many graduates of this bachelor of social science program go on to careers in law, social service, or teaching, or continue their education at the graduate level. Online courses are asynchronous and delivered via Moodlerooms online learning portal. Nonresident students are subject to higher tuition rates than residents, though active-duty military members and veterans may be eligible for discounted tuition. Assumption College is a private Roman Catholic institution located in Worcester, MA, that offers online degrees through its Continuing and Career Education (CCE) department. AC’s bachelor of science in social sciences requires students to complete at least 120 credits, though up to 75 credits are transferable. Coursework includes the school’s CCE Core -- a values-based program with an emphasis on foundational disciplines like theology, philosophy, and ethics. Within the major, students select an optional concentration in criminal justice, economics, psychology, or sociology. Students also must complete a capstone course, in which they design and implement a multi-disciplinary social sciences study under the guidance of faculty. To make its bachelor of social science online program more affordable, AC has a generous transfer credit policy that allows students to earn credit for prior work and life experience. Furthermore, the school grants transfer credit earned from any accredited institution, regardless of when the courses were taken. Students pursuing a bachelor of arts in social science online at the University of Alaska Southeast (UAS) will earn an “emphasis” in social science, which allows them to focus on at least three different concentration areas. Students choose one primary and at least two secondary concentration areas from among anthropology, economics, history, political science, psychology, or sociology. Of the 42 upper division credits required for the major, at least 24 must be completed at UAS. Admission requirements to the online program are the same as the on-campus program, and no distinction is made between degrees earned online or at one of UAS’ campuses. Graduates of the school’s social sciences program enter careers in a wide variety of fields, including human services, private business, and resource management. Note that this social science online degree is only available to residents of the state of Alaska and may require on-campus components. Social science is a broad field, so it's no surprise that most social science online degrees are different from each other. Programs range in the type of content they cover, the number of concentrations they offer, and the size of their programs. The number of credits, average completion time, and access to faculty may also vary depending on the program and school. You should spend some time learning about the details of the program and its admissions process before submitting your application. Economics is the study of the production and consumption goods, services, and labor in large and small communities. Economics encompasses an enormous amount of material under its umbrella. You can become a data analyst, statistician, or economist for agriculture organizations, universities, the government, law firms, or countless other businesses. Political Science is the study of people, ideas, and governments that create and organize society. Poli Sci majors often go into careers in politics, public policy, or governance. Law school or journalism are also popular options. Psychology is the study of mind, thought, and behavior. Becoming a psychologist or therapist is a popular career path for many psychology majors. Others may work in social services, mental health services, or as behavioral experts and market researchers. There are many research positions available as well. The specific courses and their subject matter can vary from school to school. However, most bachelor's of social science degrees offer the same core areas of study. Research Methods: Although social sciences are not natural sciences, there are a variety of quantitative and qualitative methods for gathering and analyzing data on everything from voter turnout to the macroeconomic consumption of cheeseburgers. Statistics: Introductory or intermediate statistics courses are common to help students analyze their data in any field. Statistics are necessary for modern data analysis and a popular choice for undergraduate students. Philosophy: Before the 19th century, social sciences were covered within the disciplines of philosophy. Many social science programs interact with the writings of Aristotle, Descartes, and Adam Smith for social science theory and history. HOW LONG DOES IT TAKE TO GET AN ONLINE BACHELOR'S IN SOCIAL SCIENCE? Most social science online degrees are completed in four years -- or eight traditional semesters. Like a bachelor's degree program, social science BA or BS degrees require major courses as well as university and general education requirements. Most programs require about 120 credits, although some vary slightly. Students may be able to complete their degree more quickly by enrolling in an accelerated, competency-based learning, or individually paced program. Transfer students also may be able to complete the program more quickly by transferring general education credits. Overloading on credits each semester can help lower completion time, as well. Some programs are taught in cohort models, where students matriculate at the same time and take the same classes at the same times. This model allows for greater peer interaction and academic support. Others use an individually paced model, which lets students move through courses quickly or at their own speed. A bachelor of social science online degree should be accredited. Accreditation is a set of standards decided upon by member institutions for what constitutes quality education, administration, and student support. When you earn a degree from an accredited institution, you signal to other accredited schools -- and employers -- that you hold a quality degree. Universities and colleges can be nationally or regionally accredited. Regional accreditation is much more common and typically seen as more prestigious. National accreditation is usually granted to for-profit, vocational, career-oriented, or some religious schools. Most nonprofit, academic college and universities are accredited by one of the six regional accrediting agencies. Both online and brick-and-mortar schools can be regionally accredited, and this should be one of the first things you look for when selecting an online program. Aside from national and regional accreditation, many individual programs are accredited by industry groups. This is less common among social science degrees, but some programs are accredited by public policy organizations. It is important to note that accrediting agencies are not run by the government. Rather, they are groups composed of universities and colleges, which set the standards for other programs. These agencies are recognized by the Department of Education and the Council for Higher Education as legitimate accrediting agencies. The DOE is a government agency that sets academic policy goals, but does not accredit schools itself. The CHEA is comprised of schools and also functions as an oversight body to ensure proper accreditation procedures. Check out the list of all accredited schools on the DOE's website or the CHEA's before finding deciding on a social science online degree. According to Payscale, in the first one to four years after graduation, a bachelor's of social science degree holder makes an average of about $10,000 more per year than a high school graduate. A high school graduate can expect to make about $39,000 per year in the first several years following graduation, whereas the median annual salary of a bachelor of social sciences graduate is about $49,000. Ten to 20 years after graduation the pay gap remains higher, with the BA degree holder earning about $11,000 more. The highest paying jobs for social science bachelor's degree graduates are in economics and political science. These areas of specialization allow students to pursue careers as analytics managers, consultants, financial service experts, political campaign management, and government managers. There are more than a dozen jobs for social science majors with a median salary above $100,000. Social science graduates pursue careers in literally hundreds of fields. Many of these, such as psychology, require graduate degrees and additional certifications. Others, such as positions in social science, can be started directly following undergraduate education. Although many careers in social science are related to a student's area of concentration, social science graduates thrive in other areas including journalism, marketing, sales, and consulting. Any social science bachelor's degree students can become a researcher in his or her field. Researchers excel in statistics, research methods, and other math classes. Social science students who specialize in economics can become economists as consultants or experts in a specific area. Classes in microeconomics, macroeconomics, and statistics are important. A social scientist is similar to a social science researcher, and can mean one is an expert in any of several fields. Social scientists, typically in sociology or anthropology, study human interaction. A political scientist is an expert in politics and can be a consultant for political campaigns, government offices, and political action groups. Political scientists may also conduct research or work closely with politicians. Social workers typically work for the government to provide social services to those who need them. There are private organizations that provide similar services and may be a smart opportunity for social science students as well. Regardless of your career interests, you'll be able to find a professional organization that help you get started. These organizations facilitate networking opportunities, host conferences, and offer career services and job boards. Many organizations also help students with continuing education. Paying for an online degree is similar to paying for a degree at a traditional campus. All students who need financial aid should first complete the FAFSA (Free Application for Federal Student Aid) to learn their eligibility for federal loans, work-study jobs, scholarship, grants, or more. Students can also work directly with schools to apply for grants, scholarships, and work opportunities.